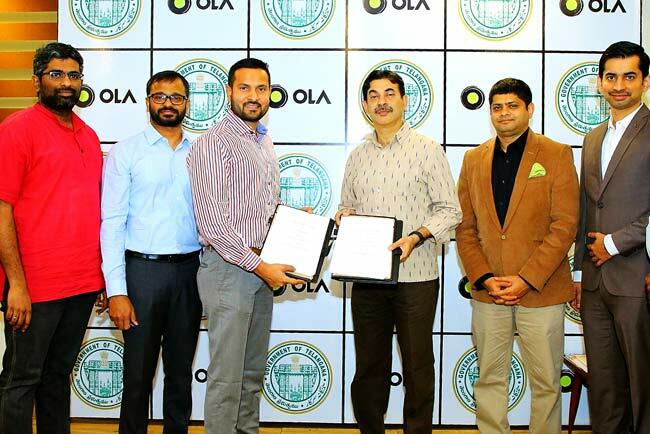 Ola, one of the world’s largest ride-hailing platforms, signed a Memorandum of Understanding (MoU) with the Government of Telangana, to support their efforts towards strengthening the traffic infrastructure in the city. This partnership will see Ola share intelligent insights that enable the Government to implement smart solutions to enhance the mobility experience in the city. The MoU was signed in the presence of Jayesh Ranjan, Principal Secretary of the Industries & Commerce (I&C) and Information Technology (IT) Departments of the Government of Telangana. The MoU marks a milestone in Ola’s efforts towards harnessing mobility data and creating tools to support transport related governance. Ola will share intelligent data to help augment the Government’s efforts to manage road traffic and congestion. The partnership is part of a wider program by the Ola Mobility Institute to create tools using mobility data and to support city-based transport planning and governance. “With mobility playing a key role in the development of a city and our focus on building a comprehensive smart city plan for Hyderabad, these valuable data insights from Ola will pave the way towards building future-ready transport infrastructure. The strategic partnership between the Government of Telangana and Ola will simplify traffic, transport management and will aid transport authorities to plan projects more seamlessly,” said Jayesh Ranjan. The first pilot project proposed to be implemented under this MoU is the dynamic mapping of riding quality of various major roads in Hyderabad through the network of vehicles operating on the Ola platform. This data will be provided to respective state government departments, who monitor road conditions and maintain the overall quality of roads in the city. The intended outcome of this pilot is to reduce accidents due to potholes, monitor the quality of road construction, and prioritize road repair budget. Under this partnership, Ola will work with the government to build innovative solutions for the city. The Telangana Government is already at the forefront of the adoption of technology for traffic management such as intelligent traffic system, automated traffic challans etc., and this partnership will further accelerate the efforts towards building a smart Hyderabad. This partnership will act as a model for other metropolitan cities to use mobility data and technology for public good.